Octagon can be confused for Japan's Great Sasuke. A black belt in Shotokan Karate, Octagón started in CMLL as La Amenaza Elegante before creating the Octagón name and look along with then CMLL booker Antonio Peña. 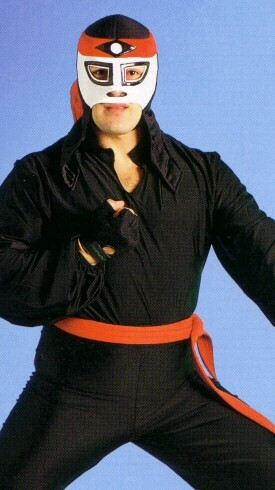 The name Octagón was inspired by the Chuck Norris movie Octagon while the look was inspired by Kung Fu & Kato Kung Lee. When Peña left CMLL to create AAA, Octagón went with him. After many years in AAA, he decided to leave after not being used much anymore. Octagón began a dispute with AAA over the rights to the Octagón name. Then in April 2016 Octagón became upset that AAA created another Octagón Jr. which he did not endorse and decided to confront Octagón Jr. at an autograph signing and appereance where Octagón publically unmasked him. During this time Octagón held a press conference to introduce his own Octagón Jr. ??/??/?? mask (0) El Hijo del Santo Amenaza Elegante ? 02/07/05 mask (3) Octagon Pentagon III Centro de Convenciones - Cd. Madero, Tamps. This page was last edited on 13 October 2018, at 13:32.